Talk to me about your background in English and writing. I’ve enjoyed reading books and writing stories ever since I was a child. English was always my favourite subject at school although I hadn’t originally planned to do it for my degree. At first, I was planning on studying law at university as I felt it would set me up for a future career but when I started my AS levels and ordered some prospectuses I couldn’t help reading the sections about the English courses and my instinct told me to go for it. Looking back, it was definitely the right decision. Even though I wasn’t entirely sure what I would do with the degree, I felt it was important to do a subject I genuinely loved, and I would advise others to do the same. What made you come to Hull University for your degree? Choosing universities to apply to was a very difficult task especially for my course as you could do it at about 120 institutions so I couldn’t possibly read every single prospectus. I asked family for advice and I found out one of my aunts had gone to Hull University. After checking the English department’s website, I felt reasonably confident that I could achieve the grades they asked for and I liked the look of the course as I had the opportunity to choose all my modules in the second and third year. I loved that aspect of it because I was able to choose several interesting modules from the Victorian period and twentieth century. I did have to do some pre-1800 modules but I enjoyed the ones I took. I am pleased I made the decision to go to Hull. A library provides an extremely valuable service and can be a lifeline for people who are lonely or might not have a lot of money. I am prepared to give anything a go. As I’m studying children’s and young adult literature, I do feel it’s important to read books from that genre. I’m currently reading Cassandra Clare’s Clockwork Angel, a fantasy novel set in Victorian England. I’m quite into historical fiction, particularly texts set in the nineteenth and twentieth centuries, though I tend to vary what I read a lot. I think the most important thing for me isn’t necessarily the genre but if there is a character I can strongly empathise with. When I was reading the last Harry Potter book, I remember getting very emotional and not wanting to read the end because I was convinced Harry was going to die. I practically begged my sister to spoil the ending for me just so I knew but I was glad I was brave enough to read on in the end! Talk to me about your MA, and why did you choose to study that subject? I was in my final year as an undergraduate and had to decide what to do after finishing. I actually came close to opting for law again as I found out I could do a conversion course for a year after finishing. However, I felt that it was a shame to leave studying English behind, as despite doing it since school there still seemed to be a lot to learn so I decided to apply for an MA course at the University of Hull. I had a choice of different programmes but because I wasn’t entirely sure what I wanted to specialise in at that point I chose the generic English Literature MA. The modules I took were in my favourite periods of study, the nineteenth and twentieth centuries. I even developed an interest in art, as one of my modules examined the relationship between Victorian art and literature. My favourite module was Modern Children’s Literature and that inspired me to start exploring girls in children’s books for my PhD topic. You are now currently studying for a PhD. Did you always want to stay in academia? Whilst doing my first degree, it hadn’t really occurred to me that I would stay in academia but after starting my Masters, I thought that I would like to continue to PhD level and see if I could get into lecturing afterwards. For the first year of doing my PhD, I had been looking at potential conferences and journals to apply to so I could get relevant experience and I still do so now but I think I’ve changed my mind about academia. I don’t regret starting my PhD and will continue to study afterwards but I am hoping to pursue other career options. Definitely being able to revisit old books from my childhood and read ones I missed out on! I’ve written two chapters so far. The first one compared Alice in Wonderland, Peter Pan and the Wizard of Oz and the latest chapter analysed Louisa May Alcott’s Little Women series. I particularly enjoyed this chapter and I hadn’t read the sequels as a child so it was lovely to get an opportunity to read one. I also learned more about Alcott when reading her diary and letters which was fascinating. Aside from the studying aspects, I enjoy the fact that I’m doing it part-time as it makes it easier for me to work, volunteer and pursue my hobbies. It means it’ll take longer but I feel the extra benefits make it worthwhile. You currently work at a library. Tell us more details about this. After finishing my MA I decided to do my PhD from home as I felt I would have more opportunities to work and still spend plenty of time with my family. I went onto a volunteering website and saw that my local library were looking for volunteers so I sent an application in. My role was a Self-Service volunteer and I was responsible for shelving returned books and helping customers find books or use the library equipment. Eight months ago, I acquired a paid Saturday job there. I have more responsibilities on the front desk and I am getting more confident using the library’s circulation systems. I still do my volunteering there as I love my job so much. There is something really special about being around books and seeing customers with huge armfuls to take out. What do you most enjoy about working for a library? That’s actually a really difficult question to answer because I love all aspects of my job. I like being able to interact with the customers and I find it very satisfying when I am able to help them find the books they’re looking for. I also enjoy the shelving, as I’m really interested to know what other people are borrowing and it’s given me a few reading ideas. My to-read list has become very long since working at the library! Is there a real community atmosphere there? I would say so. We have a lot of regular customers who come in to borrow books, use the computers and attend activities, which is lovely to see as you get to know people and what their interests are. What do you feel a library needs to do to keep the interest and involvement of the local community? I think it’s important to ensure that customers are aware about the services libraries have to offer. The system we have at our library is excellent as we are able to order books from other libraries in the county free of charge if a customer is unable to find them on the shelf. Stock displays are useful to help people find inspiration. I have recently organised one in the children’s section to do with witches and wizards. We also have several regular activities for the children including a Rhyme-time session for toddlers and babies and a Summer Reading Challenge for those in primary school. For people over 50 we have an Engage talk once a month and there have been discussions on a wide range of subjects including local history, health and crafts. 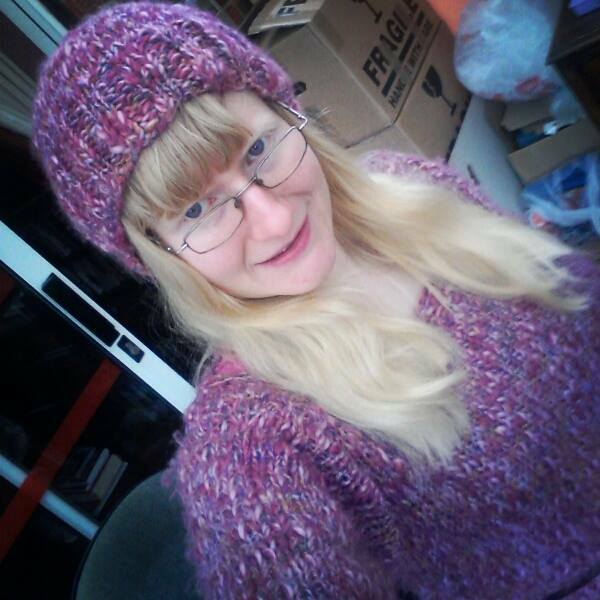 I am a regular attender of the knitting group and we usually have a large number of people particularly in the evenings. I think all of these things help to encourage people to come to the library, as they have opportunities to meet people and the activities are free unless people choose to make a small donation for tea and coffee. Do you find that there is a particular kind of literature or publication that is more popular than others in your library? Why do you think this is? Crime and adventure seem to be the most popular genres with our customers at the moment. Not having read a lot of crime myself, I can’t really comment as to why but I imagine that the novels have a very gripping plot. Our cookery and craft books are also frequently borrowed. I think people have been inspired by programmes like The Great British Bake Off and Sewing Bee. Our knitting books in particular are always appearing on the returned books trollies which is always nice to see as I’m a keen knitter and I like to think other people enjoy it too. It’s important to ensure that customers are aware about the services libraries have to offer. Where do you stand on the debate that is currently raging on whether or not prisoners should be allowed books in jail? Do you agree that books/education/reading can be vital to to a prisoner’s rehabilitation, or do you believe that they, as criminals, should not have access or the rights to books? This is a very difficult question as I know that this subject divides opinion. I believe that prisoners should be treated humanely but I think there does need to be restrictions on privileges such as televisions and Playstations. However, I do feel that they should have a right to an education and to work whilst inside, as the vast majority of prisoners are going to be released into the outside world and there is a chance they could end up reoffending if they have no purpose once they come out. I believe that having educational opportunities could potentially provide rehabilitation to criminals and if they had something to do in prison it might stop them from committing other crimes whilst inside. I appreciate this wouldn’t work with everyone but even if it only made a difference to one person’s life, I’d still be in favour of prisoners having books. Where do you stand on the argument that libraries are becoming obsolete in the current market? I don’t feel that is the case with our one as the people in the town make use of it but I know that libraries in other areas of the country, particularly rural ones are having difficulties as I have seen several petitions about saving them on social media. I strongly believe that a library provides an extremely valuable service and can be a lifeline for people who are lonely or might not have a lot of money. Tell me about your thoughts on borrowing/lending e-books and how this might affect libraries moving forward? Our customers have the option to borrow e-books e-audio and e-magazines if they own a Kindle Fire, iPad or tablet. I own a Kindle myself and find it is useful for my studies as I have saved money on classic texts and been able to read books that are no longer in print. However, I feel that there is no substitute for a physical book and I’m sure that a lot of customers would share my belief so I think the digital books will help the library to move forward, as it will give people more opportunities to borrow books and they can have them in any format they prefer. I still have three years to go on my PhD so I will be spending a lot of time focussing on that. I hope to pursue a career in librarianship once I finish it so I probably will start applying for courses once I’m in my final year. I have also had a novel idea for ages but I haven’t started writing yet so I think I’ll probably try to make some time for it and at least get something written this year! 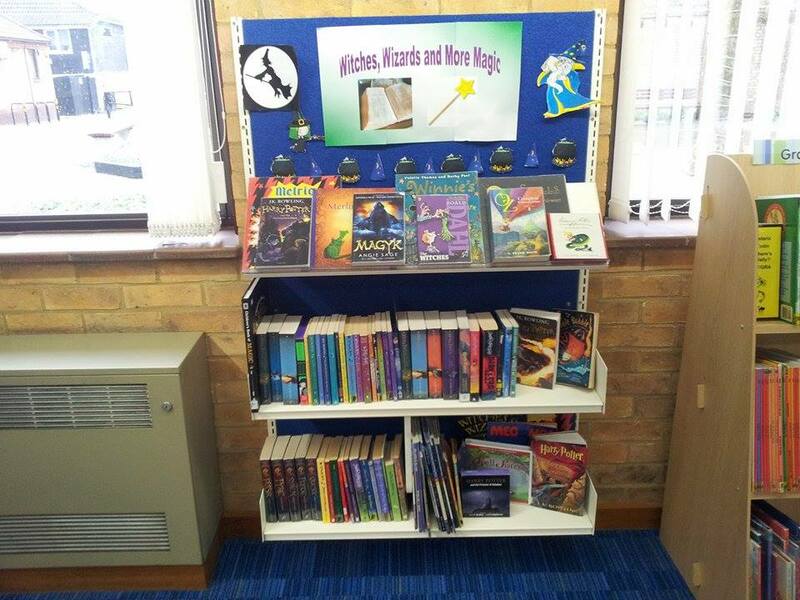 Becky’s display at the library – encouraging children to read!